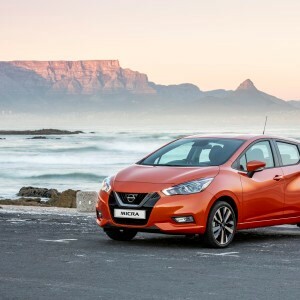 The Nissan Micra fifth generation has finally arrived in SA. Its been long awaited, and we drove the Micra in windy conditions in Cape Town recently. 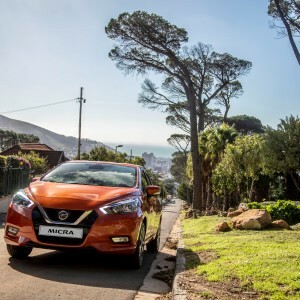 With a bold exterior design and an interior that is both contemporary and premium, the all-new Micra is perfect if you’re looking for an injection of excitement in your life. 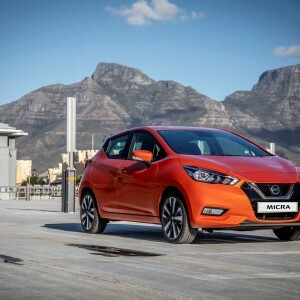 Nissan’s contender in the Lower B hatchback segment, the Micra Active, will continue to be sold alongside the all-new Micra, which will make its mark in the Upper B hatchback segment. In South Africa, the Upper B hatchback segment represents approximately 15% of the passenger vehicle market, making it one of the most popular segments in the country. The new Nissan Micra is far more dynamic looking than its predecessor. It has sculpted looks, with strong lines and a clear character. From the front, the shortened bonnet design and reduced A-pillar angle create a poised silhouette. The narrow headlamps stretch through the front wings and include signature LED daytime running lights on every trim level. Halogen headlamps are standard on all grades. The lights frame Nissan’s familiar “V-motion” grille, reinterpreted to complete the new Micra’s bold front-end design. Below the car’s sloping roof line is the expressive character which runs the entire length of the new Micra’s body, dipping dramatically as it passes over the front door and sweeping upwards towards the rear. The black B and C-pillars create a floating roof effect, while the C-pillar is home to the discrete door handles which provide access for rear passengers. The cabin is based around a T-shaped “gliding wing” dashboard, with simple structures that create excellent space for the driver and front passenger. The instruments and controls have been grouped together for comfort, convenience and safety. 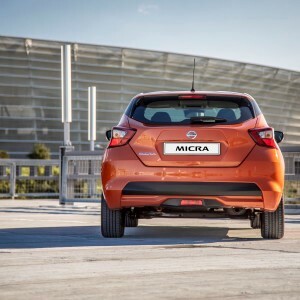 Outstanding ergonomics was another development target on the new Micra – a target which was achieved. The car sets new standards in the B-hatchback segment thanks to its smart packaging. A rake/reach-adjustable steering wheel is standard, while the lowered seating position for driver and front passenger mean there’s exceptional headroom for taller occupants. Coupled with fore/aft driver’s seat adjustment, it means a driver who is 2.03 metres tall can fit comfortably behind the steering wheel. Boot capacity is a very competitive 300 litres and delivered without compromising on rear passenger knee room. That figure expands to 1,004 litres when the 60:40 split rear seats are folded down. Smart storage options are everywhere in the new Micra’s cabin, with location, capacity and design all optimised to ensure maximum convenience for occupants. Larger items can be placed in the centre console ahead of the gear selector. It offers flat storage for a phone, and includes ambient lighting plus USB and 12v sockets. There are three specification levels available – the Visia, the Acenta and the Acenta Plus. The Visia comes standard with 15-inch steel wheels, daytime running lights, front power windows, a manual aircon, a Bluetooth and MP3 compatible audio system, cruise control, automatic headlights, six airbags and much more. The Acenta adds 16-inch alloy wheels, front fog lights among other features while the Acenta Plus has 17-inch alloy wheels, a leather steering wheel and an Energy Orange interior. When an iPhone is connected via an Apple lightning cable, it offers users Siri voice control, Apple maps with turn-by-turn navigation, access to music, telephone services and other apps such as Audiobooks and Spotify. Complementing the audio unit is the advanced driver-assist display, located in the speedometer display. Positioned to minimise “eyes off the road” time, it uses a high-definition 5-inch Thin Film Transistor colour display to provide the driver with key information about the car and journey. It’s based on technology which Nissan developed for the Qashqai and X-Trail crossovers, and is controlled using dedicated steering wheel buttons. Every new Micra comes with six airbags as standard, plus seat belt warnings and seat belt height adjustment for the front and rear. Isofix child seats are standard in the new Micra, including in the front passenger seat. Electronic safety systems include Vehicle Dynamic Control, Anti-locking Braking System, Electronic Brake force Distribution and Hill Start Assist. 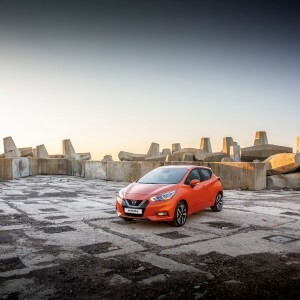 The all-new Nissan Micra is a fun car to drive, in the Cape winds it was a bit challenging, but those conditions are the norm. There is one engine available at launch– the 66kW, 140Nm Turbo-charged petrol engine which delivers both driving pleasure and outstanding practicality. The Micra also benefits from a remarkably quiet cabin, promoting a comfortable and more relaxing experience for the driver. It’s due to the enhanced noise isolation technology engineered into the car and is particularly noticeable during high-speed driving. It’s designed to allow the driver to hear the engine response, but stay isolated from other noises, such as those generated by the tyres on the road. 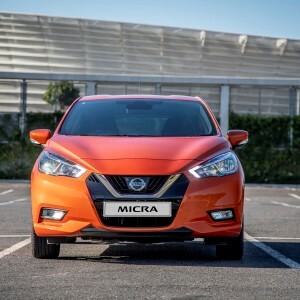 Nissan has an extensive accessory personalisation offering for the new Micra, with features and colours designed to enhance the car’s already expressive exterior and uplifting interior. In 2019, the range will be expanded with the inclusion of additional derivatives starting with the 1.0. Spec and price will be confirmed next year. To Sum up the Micra is a huge improvement on the previous design, and should appeal to buyers. The drawback is no auto version at this stage , which is sought after now.